BlaKats are back with their distinctive upbeat, uplifting music! If the slamming drum tracks don't grab you, then the positive melodious message will surely make you smile. With their distinctive upbeat, and uplifting music, BlaKats are back in a big way! If the slamming drum tracks don't grab you, then the positive message will surely make you smile, and hold that special someone closer. Covering broad-ranging themes like unrequited love, monster trucks, heartbreak, trying to do right, trick-or-treat, and nostalgic childhood memories, front-man Hollywood and guitarist G-Funk are both back in full effect. Joining the squad is multi-talented producer, beat-master, vocal arranger and rapper Dee-Man who's imprint is all over this smoking-hot new BlaKats CD. With a bold leap forward, BlaKats have evolved and grown to deliver a CD that resonates with an attention-grabbing fuller, bigger, more melodious and more satisfying sound. From frenetic dance tunes with banging backbeats to smoldering, simmering, cathartic, heart-tugging ballad and mid-tempo tunes, BlaKats have obviously tapped deeply into their music treasury, mined, and generously expended every possible ounce of creative horsepower on this brand-new CD. The growth and maturity of BlaKats' sound on their sophomore release is un-mistakable. 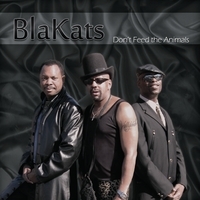 This new BlaKats CD contains digitally re-mastered versions of all-time favorite BlaKats tunes that air on RadioAirplay.com (formerly Jango). Hits like, Can't Take it Back, Ask Me Nicely, Memories, Don't Feed the Animals, Monster Love and much, much more….plus a few surprises, thrown in for good measure! It is also jam-packed with NEW previously un-released BlaKats songs! There is even a surprise on the CD. See if you can find it! This CD is HOTT!!! Don't delay! Grab your very own copy now!